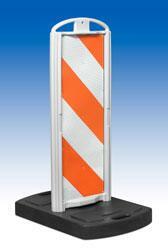 This easy to set up sign stand is ideal for temporary in-street signs or barricades. The recessed break-away frame helps protect the sign panel from damage and holds up to 12×36-inch signs. Frame fits snugly into 45-pound recycled rubber base, which features handles molded into each end for ease of transport. Panels also may be stacked together to preserve storage space. Signs attach to flexible and impact-resistant polyethelene frame with rivets or bolts-and-nuts. Meets MUTCD requirements and is NCHRP-350 crash-test certified.